When was the last time you truly saw the stars? For many of us who live in cities, it's difficult to stargaze given the light pollution, which is why travellers head to the Mongolian steppe or go on safari in Africa to bask in a blanket of stars. Though there are many destinations that boast skies so clear you can see the Milky Way with your naked eye, the Atacama Desert in Chile is certainly a top place to stargaze and witness once-in-a-lifetime occurrences such as the total solar eclipse on July 2, 2019. That, plus its otherworldy "Martian" landscapes make it prime bucket list material. To say that the Atacama Desert is a place like no other may sound like hyperbole, but its credentials dictate otherwise. Located 4,000m above sea level, this Andean plateau is embraced by the Pacific Ocean on one side and the Andes mountain range on the other, and holds the title of the driest place on earth. The last time there was a notable storm was in 2015, and some parts haven’t seen rainfall in over 400 years. What it has a lot of, however, are clear skies. It enjoys more than 300 sunshine filled days a year and has almost no light pollution—elements that come together to the delight of astronomers, who chose it as a base for the Atacama Large Millimeter/submillimeter Array (Alma Observatory), which houses the largest ground telescope in the world. Atacama tops the list for astro-tourists, and increasingly attracts urban dwellers like myself seeking to escape a view filled with smog and skyscrapers. To get to Atacama from Asia, one must first fly into Santiago, Chile’s rapidly growing capital. Most guidebooks suggest avoiding the city in August (as a valley surrounded by the snow-capped Andes mountain range, it is meant to be bitterly cold in winter) but I had it on good authority from Jobi Chan, my expert travel designer at Jacada Travel, that it's actually a great time to visit. During the planning process, Jobi assured me that the weather would warm up by the time of my stay; there’s also the upside of both places being free from crowds. As predicted, my travel companion and I landed in Santiago on a clear winter’s day greeted by crisp air, the bluest of skies, and our affable guide César. Fresh off a 13hr flight from London, we made our way to The Singular, a boutique hotel in the stylish Lastarria neighbourhood. Arriving on a public holiday, I revelled in the gentle hum of a city that was in semi-hibernation and did what I always do when I’m in a new place for the first time: walk without a fixed agenda. Jacada Travel provided the perfect companion to join my pursuit of flânerie: a 55-year-old architect who shared his insights on the city’s intense evolution as well as showed me areas that would unlikely make it into a luxury city guide. Over a number of leisurely strolls, he showed me the dichotomy of the city. Head east and there’s the gleaming “Sanhattan”—a portmanteau of Santiago and Manhattan—living proof of how cosmopolitan the city has become. Home to the country’s business district, it’s also the stomping ground of the nomadic elite who frequent restaurants such as Boragó, ranked fourth on Latin America’s 50 Best Restaurants 2018 list and hailed for its 17-course tasting menu made with flora and fauna native to Chile. Venture west and modern glass structures are replaced by crumbling Beaux Arts and Art Deco buildings, and walls riddled with colourful murals and graffiti. Gentrification is slowly creeping in, even in the enchanting Concha y Toro district, where a boutique hotel is planned next to a house owned by a 74-year-old woman who has lived there all her life. 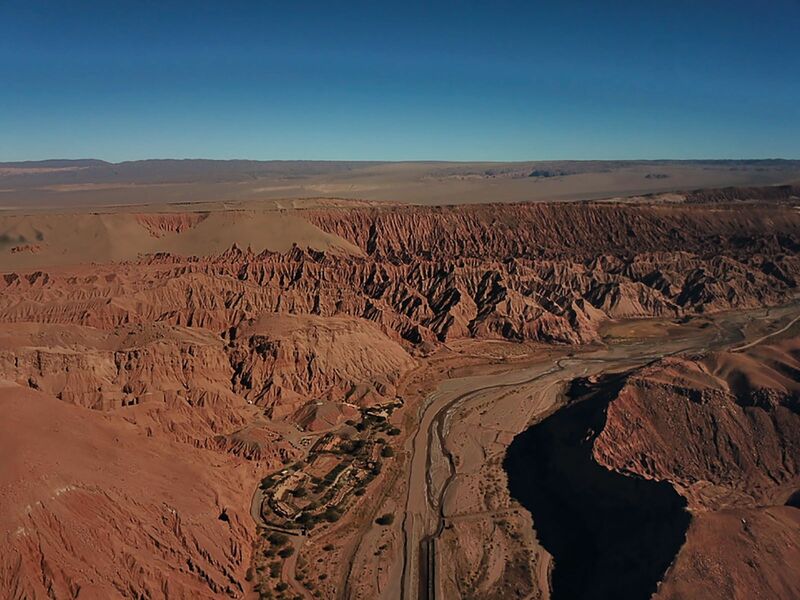 A quick flight north—where I saw the landscape change from snow-capped mountain ranges to expansive desert—I landed at Calama airport, the gateway to the Atacama region. Upon seeing the terracotta landscape, one would be forgiven if you thought you'd actually landed in Mars. The drive from the airport to the hotel was a memorable experience in itself: I had witnessed the view change from flat desert land to rugged terrain and to something that looked completely out of this world upon seeing the Valle de la Luna (Moon Valley), famous for its uncanny similarity to the Red Planet, for the first time. It was dusk as we entered the Alto Atacama Desert Lodge and Spa. When I was told that we were close to the hotel, I couldn’t make it out as it blended seamlessly with its ochre-hued surrounds. Even in the daytime, the layout and architecture allowed the manmade structures meld with the natural backdrop. It is one of those exceptional hotels that really inhabits its destination and would be impossible to replicate anywhere else. The hotel’s landscape designer, Veronica Poblete, who’s a close friend of the owner, told me of how little they wanted to alter the site when they were first conceptualising it. Using local materials and techniques, every design element in this luxury hotel is intended to celebrate the Andean culture, but nothing ever feels contrived. “I put pampas grass next to the pools as that’s the kind of vegetation that grows beside water here,” she shares, demonstrating how the small details often hold a deeper meaning. Eager to discover the desert’s otherworldly landscape, I’d mapped out a plan for the next couple of days with Alto Atacama’s expert guides. The small group excursions take guests to the top sights, but they also have other specialised activities such as a cactus hike. What I experienced couldn’t have been more varied: I welcomed the day walking through one of Atacama’s largest salt flats, Laguna Tebinquiche. I spent several afternoons turning my black trainers into a shade of terracotta by traversing the Moon Valley as well as the lesser-known Valle de Arcoiris (Rainbow Valley). Within the latter, I encountered a bewilderingly colourful mountain that has yet to become an Instagram cliche. Magic hour is extra magical at the Atacama Desert. With the elevation and sheer expanse, nothing can compare to the glorious multicoloured sunsets in the Andes. I took in the remains of the day at Laguna Chaxa, watching a flock of flamingos just a few metres away, as well as at the Valle de la Muerte (Death Valley), where I sat down savouring the mesmerising landscape with a glass of Chilean Carménere wine in hand. While I happily racked up 20,000 steps a day during my expeditions, relaxation was also part and parcel of the itinerary. I spent a few hours exploring the quirky town of San Pedro de Atacama, utterly captivated by dogs donning bandanas in place of collars. Being in the desert oasis of one’s dreams, I made sure to take a dip at Alto Atacama’s pool while enjoying its expertly made pisco sours. I also took part in the bucolic pleasures that one can only experience here, such as feeding the resident llama, Manny. But perhaps, the most relaxing of all the activities was the opportunity to be in complete darkness and looking up at the star‑filled sky. Sedate stargazing aside, I also did the Andean Astronomy tour, which was set on an open-air observatory atop one of the hills close to the hotel. "There it is… that’s the North Star,” I proudly said to our guide, pointing at the brightest star in the sky. Turns out, I was pointing to Mars. Astronomy clearly isn’t my strongest suit; I’d normally only be able to identify the Big Dipper and Orion’s Belt anyway. Here in the southern hemisphere, however, neither of these constellations appear as how I would normally recognise them. Lying on a bed and wrapped in a fleece blanket, I realised how little I knew about the universe but how much I yearned to see more of it.